A number of the issues that we identified likely stem from a conflict between the colloquial use of linguistically similar terms ‘delete’ and ‘erase’, and their very different technical meaning. In simplified terms – although the details vary based on technical nuances such as the type of memory chip and file system used – ‘delete’ is an operation in which the OS simply forgets the existence of a file, while the ‘erase’ operation actively removes the file from the system, e.g. by overwriting or flashing the binary storage. Thus, ‘deleted’ files usually remain on the memory chip until overwritten by coincidence, whereas ‘erased’ files are typically impossible to recover. Inconsistent language within the UI of an OS, such as when deleting files from Trash in macOS 10.14 shown in Figure 1, can foster the misunderstanding that the terms ‘erase’ and ‘delete’ would denote the same technical function. A lack of sufficient guidance and cues is also evident in the screenshots shown in Figure 1. For example, users could be better supported in their decision making by elaborating on the expression that they “can’t undo this action”, e.g. by adding a reference to possible data recovery through forensic analysis software. macOS 10.14 dialogue when deleting a single file from the Trash (left) and when deleting all files from the Trash (right). The latter is incorrectly labelled as erasure, despite being a deletion. Users commonly understand default options as a recommendation, reducing the likelihood of other options being selected. 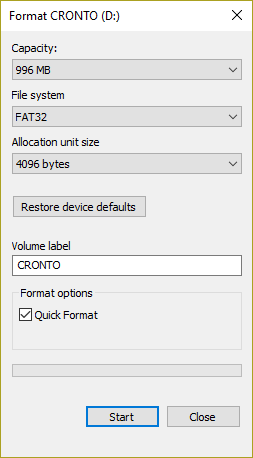 This effect is reinforced when a description text for this option is omitted, such as in case of the pre-selected Quick Format option in Windows 10 shown in Figure 2. The alternative could be to require users to make an active selection before they can proceed and to provide description texts for the available options. 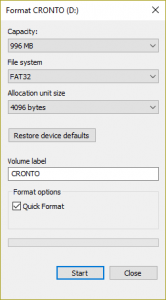 Windows 10 dialogue to format a drive has the option Quick Format pre-selected. I don’t want to be misunderstood as blaming or shaming the original designers of these UIs for their work. As I have said before, the evaluation of any design is always context-dependent. The design choices for the UI of delete and erase operations in Windows and macOS might have been okay at the time of their original design, but as circumstances around these designs have evolved (e.g., new legislation, new data recovery techniques and free to download software, etc.) they should be reconsidered. An important lesson we can (re-)learn from this is that designs need to be re-evaluated not only when they’re changed but also when their context changes. As mentioned earlier, we know since more than twenty years that users’ unintentional failure at a task “is often caused by the way in which [these] mechanisms are implemented, and users’ lack of knowledge”. Reworking the UI of Windows and macOS to improve these mechanisms is one side of the coin, the other is addressing the users’ lack of knowledge. Our paper presents a number of alternative designs, but further research is suggested to identify further shortcomings in the existing UI around deletion functionality and to implement and evaluate alternative designs. Perhaps equally important is the reconsidering of the language used to denote technical operations, and to seek alternatives to the linguistically similar terms ‘delete’ and ‘erase’. For the latter, to improve the users’ knowledge, we see the national Data Protection Authorities and the European Data Protection Board (and their international counterparts, where existing) being best positioned to create official guidance on how to erase data using popular OS and/or open source software. This work has received funding from the European Union’s Horizon 2020 research and innovation programme under the Marie Skłodowska-Curie grant agreement No 675730. Previous Previous post: Science “of” or “for” security?